Diabetes have various complications when they are not managed for a prolonged period. Heart disease and stroke are examples of major ailment that the risk of developing them is increased when someone has diabetes. Diabetics are usually prone to developing heart disease and stroke much in life compared to people that does not suffer from diabetes. Studies have suggested that middle-aged people that suffer from type-2 diabetes have an increased chance of acquiring heart attack as high as someone without diabetes who has already had one heart attack before. On a normal condition, women who have not gone through menopause usually have the risk of heart disease than men of the same age. But women of all ages who are diabetics have an increased risk of heart disease, this because diabetes had cancelled the protective effects of being a woman during her child-bearing days. People with diabetes who had already experienced one heart attack before in their life have a high probability of acquiring a second one. To add to that, heart attack in diabetes patients are more serious and have a high chance of resulting to death. Diabetes like we all know is a disease which leads to an increase blood glucose level. Increased or high blood glucose levels with time can lead to increased deposits of fatty materials on the blood vessel walls. This deposits will eventually affect blood flow, increase the chance of clogging and hardening of the blood vessels (atherosclerosis). 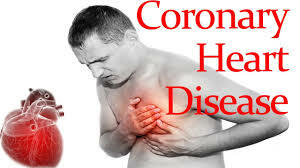 Another risk factor for heart disease and stroke is having a family history of heart disease. If one or more members of your family had a heart attack at an early age (before age 55 for men or 65 for women), you may be at increased risk. You cannot change the fact whether heart disease runs in your family or not, but you can take positive steps to control the other risk factors listed below. Central obesity is a situation whereby extra weight is been carried around the waist area, as opposed to the hips. A waist measurement of more than 100cm for men and 88cm for women means such a person have central obesity. His or her risk of heart disease is higher because abdominal fat can increase the production of bad cholesterol (LDL cholesterol), the type of blood fat that can be deposited on the inside of blood vessel walls. LDL cholesterol when build up inside the blood vessels can lead to hardening and narrowing of the arteries (the blood vessels that carry blood from the heart to the rest of the body). The arteries can then become blocked. Therefore, an increase in the levels of LDL cholesterol raises your risk of getting heart attack. Triglycerides is another example of blood fat which an increased level can raise the risk of heart disease. If someone is suffering from high blood pressure also known also hypertension, such a person's heart always work harder in order to pump blood. High blood pressure can strain the heart, damage blood vessels, and increase your risk of heart attack, eye problems, stroke, and kidney problems. Smoking doubles the risk of acquiring heart disease. Quitting smoking is highly important for diabetics because both smoking and diabetes narrows the blood vessels. Smoking also increase the risk of long term problems such as eye problems. Additionally, smoking can damage the blood vessels in the legs and increases the risk of amputation. You should always checkmate your diet and make sure that they are heart healthy. Include at least 14 grams of fibre daily for every 1,000 calories consumed. Foods high in fibre has the potency of lowering blood cholesterols. Oat bran, oatmeal, whole-grain breads and cereals, dried beans and peas (such as kidney beans, pinto beans, and black-eyed peas), and vegetables are all good sources of fibre. Increase the amount of fibre in your diet gradually to avoid digestive problems. Make sure you cut down on sugars, starches and all forms of carbohydrates. Carbohydrates can cause a rise in sugar levels which can result to inflammation in the arteries, causing cholesterol levels to rise. Believe it or not, but sugar in foods causes triglycerides to rise which lead to an accumulation of LDL on the inside walls of the arteries. Carbohydrates are very high in cookies, maize, bread, chips, potatoes, and most starchy vegetables. You also need to cut down on sugary drinks too. Physical activities should be a part of your daily routine. Aim for at least 30 minutes of exercise most days of the week. Opt for methods of increasing physical activities, for example you can take the stairs instead of an elevator. If you have not been engaging in physical activities recently, i will suggest you see your doctor for a checkup before your commence an exercise program. If you know you are a smoker, it is better for you to call it quit. Your doctor can easily prescribe a way to quit smoking for you. Or you can check on 10 easy steps to quit smoking for men.